Dealer's Choice: A lesson in never playing poker with a stud. The Memory Expert At The Bridge Table and Fuggeddaboutit: A pair of blockbuster memory demonstrations that will make you look like uh, what's his name. Sting, Too: A Texas Hold 'Em demonstration for experts and those who think they're experts. Five Aces: Your run-of-the-mill poker routine starts with five aces, ends with a royal flush. The Kicker: A combination poker demonstration and pick-a-card trick that relies solely on 'luck'. Plus thoughts on effect construction and even some left-handed card moves. Not for the beginner or anyone who wants to keep getting invited over for poker nights. Definitely for lovers of strong card magic. Shuffle up and deal. "He's honest, you just gotta watch him a little." 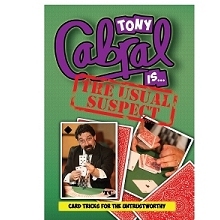 Tony Cabral has long been a well-kept secret among a select few card workers. Now he's finally agreed to share some of his favorite original routines with you. 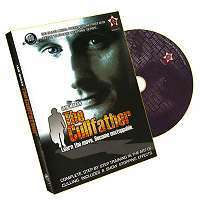 You may watch this DVD for the first time and think to yourself, 'this guy is a rascal.' After seeing how he thinks and how that translates into action at the card table, you may think, 'this guy would have been a natural a century ago.' But there's far more. 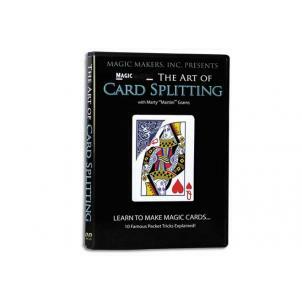 Combining strong thinking with sleight-of-hand skill and good old fashioned sneakiness, these demonstrations will make you look like an expert or a reasonable facsimile thereof.